Covers Zip Codes: 15102, 15129, 15210, 15211, 15216, 15226, 15228, 15234, 15241, 15243. 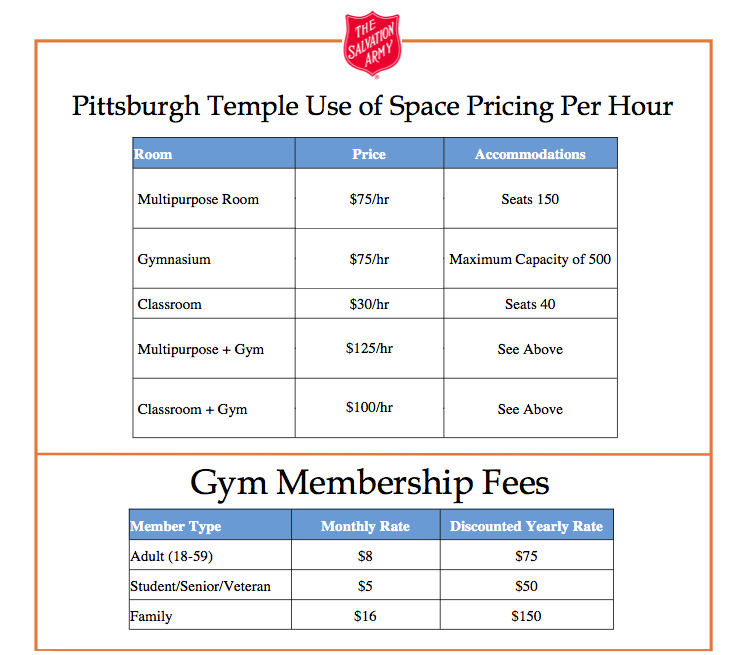 The Salvation Army’s Pittsburgh Temple Worship & Service Center provides all of your Community Center needs at a convenient location. 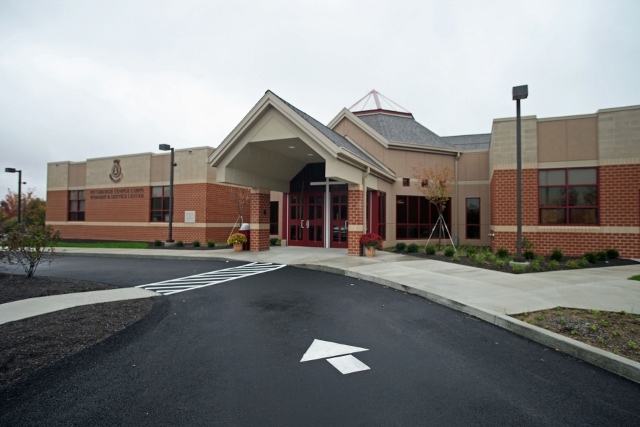 Built in 2011, our facility, located on McNeilly Road, is equipped with a multipurpose room, commercial kitchen, gymnasium, fitness center, classrooms, and more. 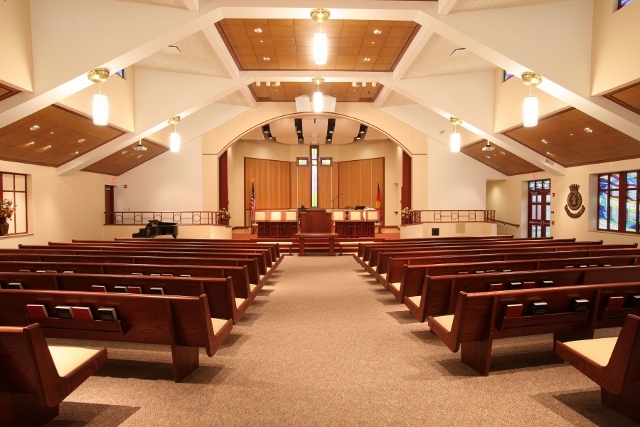 It is the perfect location for your next birthday party, banquet, or sport’s team practice. Affordable memberships are available for individuals and families interested in using the gym and fitness center during regular office hours. 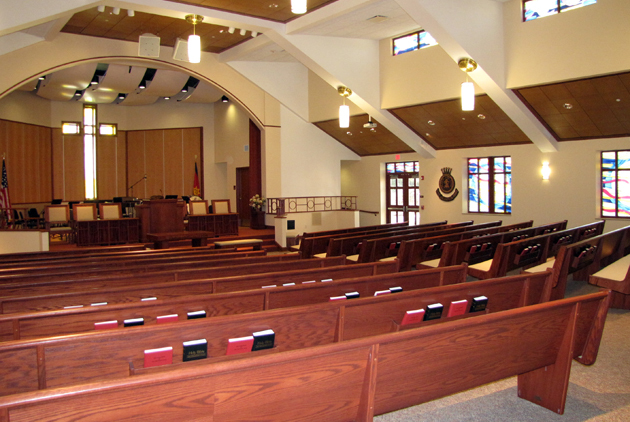 Multipurpose Room - With seating for up to 150, this is the perfect room for your next party, banquet, shower, meeting, or other special event. The multipurpose room is adjacent to the kitchen for those hoping to serve food at their event. This room can also be divided into three sections if needed. Gymnasium - Our large gymnasium is the perfect location for your next indoor sport practice or league. Whether it’s basketball, soccer, volleyball, or any other activity; we have 7,000 sq. feet of floor space as well as bleacher seating to use. The gym is also available to use during parties. Fitness Center - Members can enjoy access to our fitness center with various cardio equipment and weight-training machines. Members also have access to our gymnasium when not in use. Classroom - Looking for a smaller space for your next meeting or smaller party or event? Our classroom can seat up to 40 people. Kitchen - Access to our large commercial kitchen is also available to use with most events. ♦ Facility use inquires can be made in person or by phone by contacting Kristie Dodds at 412-207-2127. ♦ All signed paperwork and any applicable insurance certificates must be on file in our office to reserve your space. ♦ Gym members must stop by the office to fill out an application and waiver. ♦ A full list of our facility use policies and procedures will be provided with your agreement. ♦ Any outside facility use can not interfere with existing community serving programming of The Salvation Army. We hope that you will join us for all of these exciting opportunities!